If you update your mobile forms regularly, then you may also need to update the custom templates you are using. Changing question names or adding additional questions to forms are a few examples of when editing your template is required to receive data successfully. Follow this guide for updating a custom template associated with a Word or PDF destination. In the example below, you have a Work Order form in which you've added a new question for users to input additional comments. In order to receive this new data in the PDF destination that you have setup, you'd need to add the corresponding question placeholder to your uploaded template. First, go to the "Forms" page and click the link in the Destinations column of the form you would like to add the Destination to. Next, click the pencil icon to the far right of the Word or PDF destination. On the following page, navigate to section 2 and click "Show Options". After, a menu will appear where you can download your previously uploaded template. It will appear as a hyperlink underneath the "Upload my Word.DOCX template" button. When you click the link, a download will be triggered which will contain your existing template. In the same section that contains your uploaded template, there is also a link to "Download a sample template" which you'll also need to select. This document will contain all of the updated placeholders in the form. After clicking the link, another download will triggered. This document includes the newly created "Additional Comments" question. Next, open both the sample template and the custom template which was just downloaded. In the sample template, scroll to the new question. Then, copy/paste the "Additional Comments" placeholder into the custom template. No further customization is required for this template so save the changes in Word and navigate back to the "Edit Destination" page on the website. 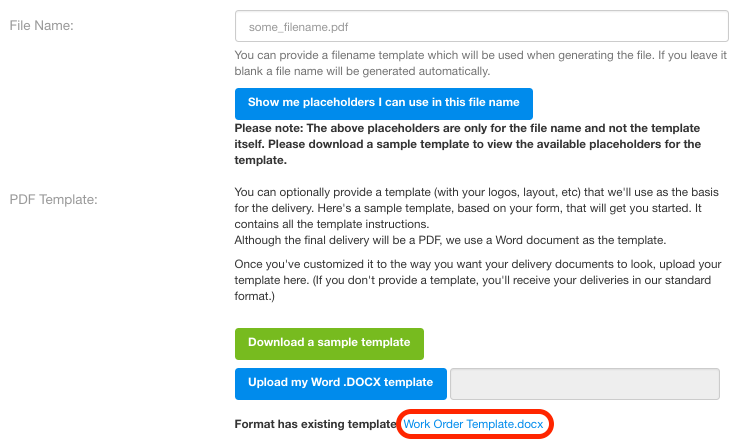 To upload the updated template, click the "Upload my Word .DOCX template" button and select the file. Lastly, click "Update Destination" and you're all set! Future PDF's generated for this form will now contain these additional comments.